Corn muffin mix forms the crust of this hearty, meatless Veggie Taco Cornbread Pizza. 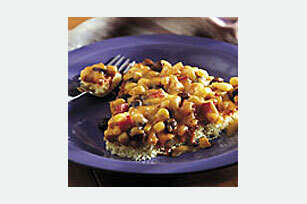 It's topped with cheddar cheese and taco-seasoned corn, black beans and red pepper for an unbeatable taste. Combine taco night and pizza night into one with our yummy Veggie Taco Cornbread Pizza. Prepare corn muffin batter as directed on package; spread into greased 12-inch pizza pan. Bake 8 to 10 min. or until lightly browned. Meanwhile, combine peppers, corn and beans in medium saucepan. Add seasoning mix and water; cook 10 min., stirring occasionally. Sprinkle 1 cup cheese onto crust; top with bean mixture and remaining cheese. Bake 4 to 5 min. or until cheese is melted. For added color and texture, serve with a mixed green salad. As a bonus, you'll also get a serving of vegetables! Substitute a 13x9-inch pan for the pizza pan.